Spring is one of my favorite seasons because I have so many wonderful reasons to celebrate. Not only is my dad and sister’s birthday’s in the spring, but so is Baybah’s. It is hard to believe that almost 2 years ago, we were announcing the birth of our precious baby boy. When selecting our birth announcements, we used Shutterfly because of their beautiful selection. We chose the one below because of the modern look and bright colors. I love how easy Shutterfly announcements are to create. You just upload your photo, add it to the card of your choice, and then edit the words that you would like on your card. Shutterfly will then send you your beautiful announcements in no time. Did you know that Shutterfly also makes amazing photo books too? To celebrate Baybah’s first year, I made him an ABC photo book using a special picture for each letter of the alphabet. This book turned out amazing. 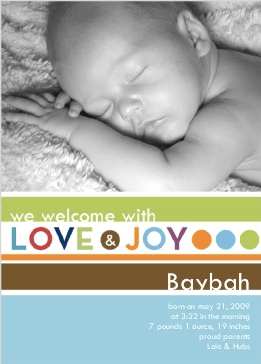 It brings tears to my eyes remembering all of the special moments from Baybah’s first year. One lucky Crazy About My Baybah reader will win an 8 X 8 photo book from Shutterfly! What is your Spring celebration? Follow Crazy About My Baybah on Google Friends Connect. Become a fan of Shutterfly on Facebook. If you would like, tell them Crazy About My Baybah sent you! Become a fan of Crazy About My Baybah on Facebook. Follow Crazy About My Baybah on Twitter. Tweet about this giveaway using the tweet button below. Leave the link in your comment. You may tweet 3 times a day (at least an hour apart) for extra entries. Add this giveaway to a linky, contest listing, or blog about it. Leave me the link. This post is part of a series sponsored by Shutterfly. I was selected for this sponsorship by the Clever Girls Collective, which endorses Blog With Integrity, as I do. All thoughts and opinions are my own. This giveaway is open to US residents 18 and up, and will end on 4/28/11 at 8:59 pm PST. I will contact you by email, and you will have 48 hours to respond before a new winner is selected. Our spring celebration is Easter and my son’s birthday. mine will be the birth of my child! Our big Spring celebration is hosting our annual family egg hunt. We have a couple of birthdays and an anniversary. I’m a fb fan of Shutterfly. we will be able to finally adopt our foster baby later this year!!! I am celebrating the end of a long, cold, wet winter. We are planning a family getaway soon. I can’t wait! I’d love to win this! We celebrate the birth of Jesus in the spring and family birthdays. I’m a fan of Shutterfly on Facebook! My spring celebration is planting all sorts of new goodies in my garden, and taking time to smell all the wonderful new blossoms blooming! My mom and I always take one week to travel together each spring! It is a wonderful celebration of family and life! I celebrate being able to go outside again!! Winter is cold and long here and I’m really not a fan of the snow and ice and wind and layers and layers of coats. Going for a walk? Cooking on the grill? Yes please! we will be celebrating number 2 on the way. Our spring celebration is Earth Day stuff! My favorite spring celebration is Easter! Getting the garden in order and enjoying the change of seasons. Oh – and firing the grill. Following Shutterfly on twitter as ky2here1. Celebrating a healthy and happy family! Mother’s Day is my spring celebration. We are going to be celebrating my mom hiking the Appalachian trail. Mother’s Day and planting the garden! My spring celebration is the family get together over Easter weekend! We cook lots of food, play games outdoors as a family, and just enjoy spending quality time with the family! I am a fan of Shutterfly on Facebook and told them you sent me! I liked Shutterfly and told them you sent me. I follow shutterfly on Twitter @ozarkmamareview. My daughter and I both have May birthdays and when turn that into a spring celebration each year. Our spring celebration is just rejoicing for warm weather! We have so many spring celebrations! From March through May me and two out of three of my sons have birthdays, my husband and I have our anniversary, my sister-in-law’s is getting married, plus all the OTHER celebrations like Easter and Mother’s Day! I Follow Crazy About My Baybah on Google Friends Connect- emillie. I am already a fan of Shutterfly on Facebook – emillie rose. I am a fan of Crazy About My Baybah on Facebook – emillie rose. I Follow Shutterfly on Twitter – hisprincess886. I Follow Crazy About My Baybah on Twitter – hisprincess886. I shared on twitter – http://twitter.com/#!/HisPrincess886/status/63302906799071232. I am a google rss follower. I also entered the Freshetta giveaway. I Subscribe by email – using my emillie(lastname)@gmail.com address. Our son is turning 1 this spring!!! We plan to have a week-long celebration that spans 3 states in order to celebrate with all those that are important to us! Our daughter will be turning 2. My spring celebration is just spending time with the ones I love outdoors. I liked Crazy about my Baybah on twitter. my daughter’s birthday is next month so that’s always a celebration w/ 4 sets of grandparents! Become a fan of Shutterfly on Facebook. my spring celebration is simply bing able to go outside without being covered by a million layers. Its like, freedom! I am following shutterfly on twitter! I entered the by the slice giveaway! I subscribed to your e-mails! We love celebrating Cinco De Mayo. We love to have carne asada and totillas! Our Spring celebration is spending as much time outside enjoying the warm weather as is possible! I follow Shutterfly on Twitter (mail4rosey). fan of Crazy About My Baybah on Facebook. We’re having a baby! Any day now. Easter is our Spring Celebration. My spring celebration is cleaning my house after the school semester is over with! I follow Shutterfly on twitter!